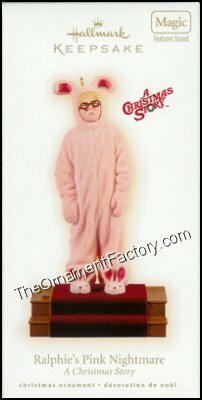 While you probably didn’t find yourself sporting pink bunny pajamas on Christmas morning, we can still appreciate Aunt Clara’s effort to turn Ralphie into a Christmas morning Easter bunny in the 1983 American holiday classic, A Christmas Story. Where else than from this legendary film could we have learned that one’s tongue can actually freeze to a flagpole? Or that it might be extremely offensive to substitute “l’s” with “r’s” when replicating an Asian accent? If anything, we know now that all it takes is the ultimate “triple dog dare” from a couple scheming friends and you might just shoot your eye out. Only 40 minutes from our location (OK, 30 for those of us who are considered a “lead foot”) stands the legendary home where the Old Man’s awarded lamp, shaped like a woman’s leg wearing a fishnet stocking, shines in the front window for all its visitors. 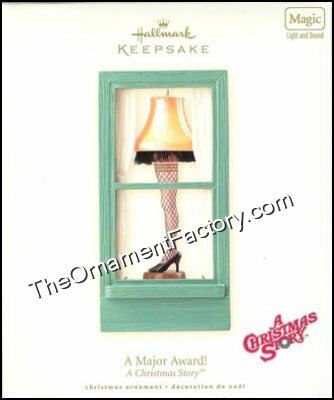 That’s why we here at The Ornament Factory think it would be swell to provide you with a little piece of the action for your very own home from our A Christmas Story Hallmark ornament collection. Remember when we learned that saying, “ Oh…fudge” sometimes just doesn’t get the point across as … nicely as we’d like? Well, we captured Ralphie’s very own slip of the tongue, too. Since 2006, we’ve been selling these special Hallmark ornaments like the well known leg-shaped lamp you see to your right, and of course our ornament featuring Ralphie’s ridiculous pink bunny suit, seen below. Hanging on your already beautifully decorated Christmas tree, these ornaments add just an extra pinch of life and daily chuckles as you share these scenes with generations after you and those still to come. The legendary leg lamp is “A Major Award” anyway, right? It just makes sense to have a little piece of the prize on your own tree. As the 2011 holiday season comes to an end, remember that your tree could always use some new garnishing in years to come, so go ahead and treat yourself with a classic holiday Hallmark ornament that’s bound to get your family and friends talking, remembering and laughing … we triple dog dare ya! Check out our Facebook and Twitter pages for new deals and promotions on all of our special Hallmark ornament collections. From our family to yours, have a happy and healthy new year!